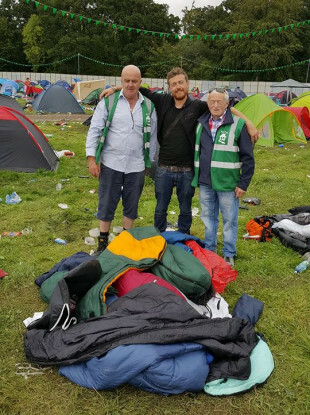 BY PICKING THROUGH the objects left behind by the attendees of this year’s Electric Picnic, one homelessness organisation has managed to collect over 1,000 sleeping bags, which will be distributed to voluntary groups over the country. Instead, the team walked into the campsite and saw thousands of tents left behind. When three volunteers spent yesterday collecting in the Jimi Hendrix campsite, they brought home six two-man tents filled with sleeping bags, Duffy said. And since then, the response has been “unreal”, with members of the community in Portlaoise volunteering to wash the bags and donations coming in of everything from biscuits to toiletries for the organisation to distribute. My front garden currently looks like the picnic. Path goes to Dublin once a week, where it distributes essential goods, including hot food and drinks, to the homeless. The organisation will keep 520 bags itself, and give the rest to other voluntary organisations. They’ll give 100 of these to another homelessness charity in Dublin, Billy Fitzpatrick, Path’s secretary, told TheJournal.ie. In Ireland, the homelessness crisis has reached a new urgency after three homeless people died in the country last week. Duffy said that the demand to go to Dublin with Path is so high that volunteers can only go once every few weeks. What you see on a Saturday night in Dublin would make a stone cry. Environmental groups had been calling on attendees to bring home their camping gear before the festival began, and photos of campsites filled with debris that have emerged since it ended on 3 September have sparked online fury. While Duffy notes that the “last thing [festival goers] want to be doing on Monday morning when 90% of them are hungover is roll up sleeping bags and tents”, more co-operation between charities and festival organisers could minimise the waste left behind. He praised the festival’s staff, saying “they couldn’t do enough for us”. The group plans to return next year to double their efforts. Next year we plan to have 30 people waiting at 11 o’clock on Monday morning. We’ll get 2,000 sleeping bags in one campsite. Email “'We said it would be good to get 50': Homeless organisation collects over 1,000 sleeping bags left at Electric Picnic”. Feedback on “'We said it would be good to get 50': Homeless organisation collects over 1,000 sleeping bags left at Electric Picnic”.